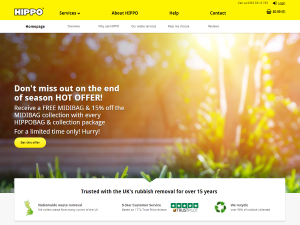 HIPPO are the UK’s leading waste disposal experts and the company behind the HIPPOBAG. They offer a range of rubbish-removal solutions to suit every need and budget – via a fleet of bespoke vehicles and a team of friendly drivers – and their service is rated as excellent on Trustpilot. HIPPO are experts at clearing waste from all kinds of projects across the UK, including DIY work, large-scale renovations, garden clearances, repair and maintenance, home moves and more. HIPPOBAGs come in three different sizes ranging from one to four cubic yards, and if you order by midday they arrive next day as a flat-packed solution, ready for you to use whenever you’re ready!